Merchant Square Christmas Craft Fair! Are you looking to get away from the city centre crowds, buy all of your Christmas gifts under one roof, support local artisans and still have time left for dinner and drinks? 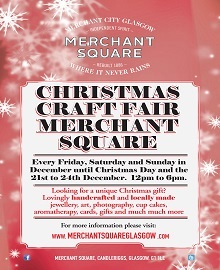 Then look no further than Merchant Square's Christmas Craft Fair! From noon until 6pm every Friday, Saturday and Sunday in December, and daily from Monday 21st until Christmas Eve, Merchant Square will fill up with over fifty local crafters, designers, specialists and artists. Find the perfect gift for your loved ones at our Christmas Craft Fair - a one-stop shop for all your Christmas needs!